Stupid is what stupid does? Or is it Stupid says what stupid represents? The definition of the word "naive" is a person showing "a lack of wisdom, experience or judgement". Obama has proven himself to be a key illustration of the word on many issues especially as it pertains to foreign policy and the threat posed by Islamic Extremists. When it comes to the issue of Islamic Extremism, Obama and his world travelers who share his warped ideology on the subject are ideologically senile. They remind me so much of the cartoon Mr. Magoo with him trying to pet a mad dog while seeing it as fuzzy cute kitten. That's liberal for you, people who see the world for how they wish it to be but not how it is. The comments by the State Department spokeswoman Maria Harf have made her famous for all the wrong reasons. More importantly, her comments underscores just how Obama and his inner circle truly are out of touch and don't see Islamic terrorism and fundamentalism in the same light as must Americans and even the world for that matter. Last week on the Chris Matthews Show on Lean Progressive MSNBC, Marie Harf of the State Department said that America can't "kill their way out" in defeating Islamic Extremists and that the way to defeating Islamic Extremism was with "job training" and "jobs" and helping people start businesses. When I first heard Ms Harf's comments, my face froze with utter shock at how stupid that sounded, but then I remembered who her boss is and I just sighed. Dear Leader would rather be water boarded then to ever mention the words "Islamic Extremism, Extremists, Terrorism or Terrorists" in the same breath. Like I've always said, stupidity and ignorance are "party affiliation neutral. I remember when George Bush used the term "The War On Terror". What many people including conservatives didn't realize that Bush never injected the word "Islamic" in between the words On and Terror. So Bush was really no different in how he addressed Islam and white washing it in it's role in terrorism. 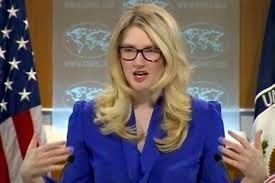 Now as for Ms Harf, she represents the State Department of the current administration, which is Obama's. Her comments about the "root causes" of why 17 year olds (FYI the vast majority of Islamic Terrorists are much older then 17) are picking up AK-47's is utterly absurd. It's not, because they don' have their own businesses, jobs etc. Liberals like Ms Harf, Obama etc are intellectually incapable of seeing the true "root cause" for why Islamic Extremists exist. The answer is obvious to any non progressive minded person. It's the Islamic Imams who are BRAINWASHING people into becoming Islamic Terrorists. not the lack of jobs, or job training. Nobody in their "right mind" wakes up one day and say "I'm bored, I think I will become an Islamic Jihadist instead of playing my Playstation. Again, only a progressive minded person could not see the true "root cause" of how Jihadists are born. Does anyone think that Imams like Abu Hamza recruited followers by promising them jobs and their own business? Who will stand up to ISIS? Why is Obama such a staunch defender of Islam? As Christians are being slaughtered in parts of Africa and the Middle East at the hands of ISIS, Al Queda etc, Obama has remained pretty much silent as these brutal atrocities continue. Obama on the other hand wasted zero time in coming out in trying to defuse the anger many people felt over the Islamist attack on the French Satire Newspaper Charlie Hesbo. I don't believe I've ever heard of nor read a story of Christians attacking anyone due to that person mocking or disrespecting a symbol of Christ. That is the true moral equivalence that can not be drawn by Obama nor anyone else on the left. What Obama and progressives can't admit is that there is no Christian, Jewish, Hindu nor Buddhist versions of ISIS, Al Qeada, Hesbola, Islamic Jihad, Boko Haram etc. I don't know where did Obama get the notion that Christianity was responsible for slavery in the Untied States. Anyone who studied U.S History and the era of slavery knows that slaves were used for cheap labor. As for Jim Crow, again I don't know how this fool thought that Jim Crow was somethingng that was created out of religion by Christians. This is the reason why Christians have responded so negatively to what Obama has said. It's because there is no factual basis for any of it. 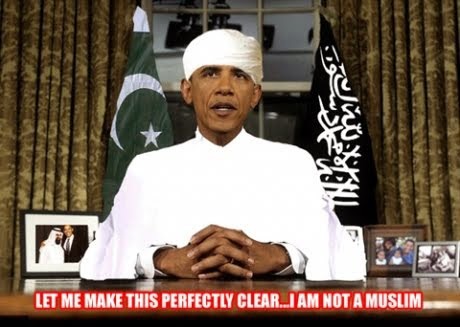 The more Obama tries to defend Islam, the more he makes an utter fool out of himself. I remember when Obama claimed that the United States "we are no long a Christian nation.". yet the MAJORITY of Americans still identify themselves as Christian. This just goes to show how completely out of touch Obama is. To go further he claimed at the National Prayer Breakfast that Islam was "our" religion. Of course the national media didn't dare ask him what he meant by that. They have simply gone after in trying to discredit those who heard him said it. Is Obama truly a Muslim who can't help himself in defending his true faith when the circumstances demand it?